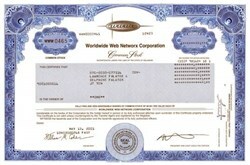 Beautifully engraved certificate from the Worldwide Web Networx Corporation. This historic document was printed by the Security Columbian United States Banknote Corporation and has an ornate border around it with a vignette of the company logo. This item has the printed signatures of the Company’s President and Chief Executive Officer ( Robert Kohn ) and its Secretary ( Allen Cohen ). WorldWide Web NetworX was based in Mount Laurel, New Jersey, and operated ATMcenter.com, its Internet wholesaler and re-marketing operation. WorldWide Web NetworX also acquired and developed technologies that enhanced business-to-business e-commerce solutions... but ended up as a Dot Com Casualty.